VDOT is finishing up work on new bike lanes on South Lakes Drive in Reston as part of the 2018 repaving season. South Lakes Dr was changed from having 2 lanes in each direction to having a single travel lane in each direction and buffered bike lanes. 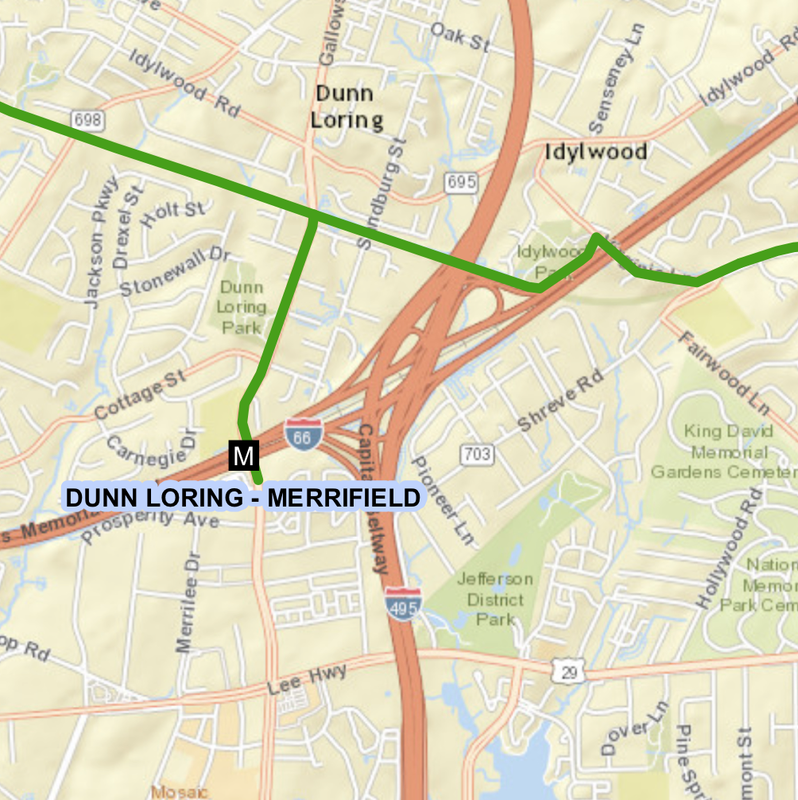 During the public meeting held in March of this year, residents were opposed to county's proposal, even though traffic counts indicated that traffic flow would be minimally impacted. As a compromise, VDOT did not reduce the lanes the section of road that includes South Lakes High School as residents felt strongly that full capacity was needed there. As a compromise, an alternate route was identified using Ridge Heights Rd and Soapstone Dr. Ridge Heights will be getting bike lanes later this year and there are already bike lanes on Soapstone. Today we noticed that FCDOT has placed South Lakes Bike Route signs along the section where the route deviates from South Lakes Dr. Thanks to VDOT and FCDOT for implementing this project and installing wayfinding signs. The massive traffic jams that some residents predicted would occur once school was back in session have not happened; traffic seems to be flowing just fine and we're seen more cyclists using the road. Let's hope that once people discover this new bike facility that many more will join them. Here is a photo of one of the new bike route signs. 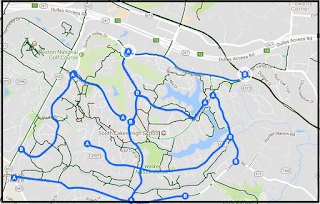 In south Reston there is now an almost complete network of bike routes leading to the village centers, the W&OD Trail, the Metro station, and other destinations. Soon there will be a new separated bike facility along Sunrise Valley Dr that will be important as new residential units are being constructed. Here's a map that we just put together showing the major on-road bike facilities (except for the trail shown along Sunrise Valley Dr leading to the Metro station. Ready to bike 100 miles for a good cause? Mark your calendars now for Saturday, November 3, 2018, when the first annual Lime Connect Century Ride presented by Bloomberg Philanthropies will be held in Reston. Lime Connect is a global not-for profit-501(c)(3) organization that is “rebranding disability through achievement.” They do this by attracting, preparing, and connecting high potential university students and professionals—including military veterans—who happen to have all types of disabilities for scholarships, internships, fellowships, and full time careers with Lime Connect’s corporate partners. The Lime Connect Century Ride is a first-of-its-kind event that will bring together passionate riders and supporters for a scenic ride around Reston. 100% of proceeds will go towards research, high school scholarships, and program expansion. In addition to the Century (100 miles) route, Metric Century (62 miles) and 30-Mile courses will be available. Registration closes on October 27, 2018, so sign up now here. Can’t make it? Then please consider making a donation here. Also, please help spread the word on this great ride. 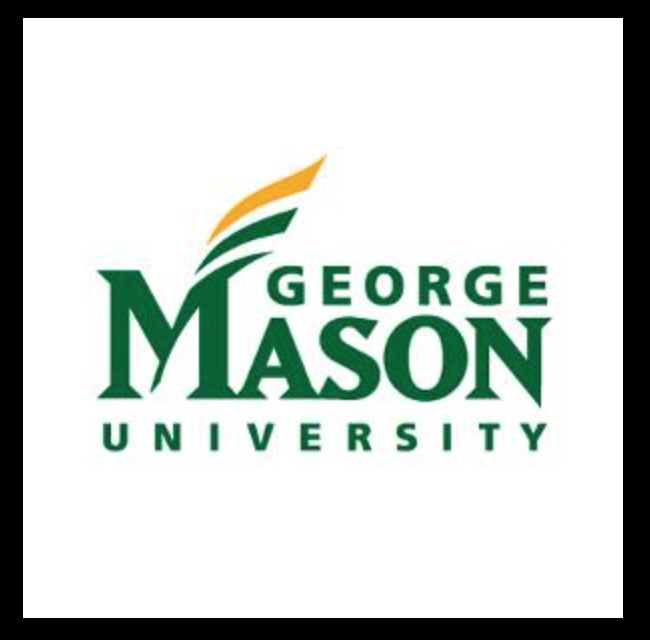 FABB is proud to be working with George Mason University’s Transportation Office to offer bicycle classes for students and staff this fall. Details are being finalized, but we are tentatively set to hold classes on September 21 and October 20. If you or someone you know is a GMU student who would like to learn to ride a bike, please mark the dates and watch for registration details here or on FABB’s other social media. GMU is very supportive of biking. In early September its Parking and Transportation offices will help Mason cyclists to register their bikes and even provide first-time registrants with a free U-lock, bike lights, safety information, and more. Mason Recreation, the Office of Sustainability, and Parking and Transportation have teamed up to bring the Mason community a free bike check out program. This pilot program will start with five bikes that are available for checkout for a day at no cost. Details on both of these programs can be found here. Support FABB When Buying from Amazon Using "Smile"
It's easy to support our work at FABB when you shop at Amazon. Instead of using amazon.com, navigate to smile.amazon.com and sign in. Go to "Accounts & Lists" and on the dropdown menu select "Your Amazon Smile." Then search for Fairfax Alliance for Better Bicycling, Select it, and the next time you shop on Amazon use smile.amazon.com. "AmazonSmile Foundation will donate 0.5% of the purchase price from your eligible AmazonSmile purchases." Learn more about Amazon Smile. In June the Virginia Department of Transportation held a Design Public Hearing on the Tysons-Old Meadow Road project. 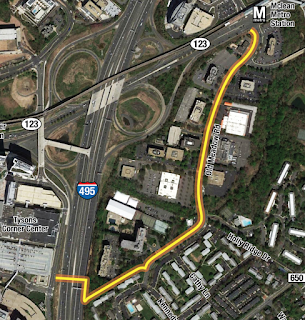 This project, in cooperation with Fairfax County, will build a pedestrian and bicycle bridge over I-495 and shared-use path in the vicinity of Route 123 to improve bicycle and pedestrian safety and connectivity in the Tysons area. 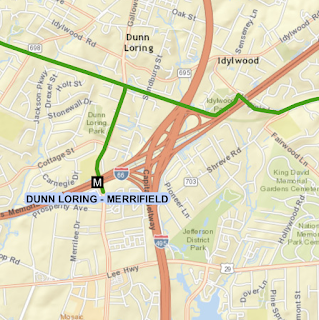 VDOT recently completed a required Environmental Studies Memo (ESM) to assess the impacts of changes in the project and determine the significance of any new potential impacts since the approved environmental document in 2006. FABB supports this project as an important step in making biking in the Tysons area easier and safer. If you have any questions or comments, please email Steven Warner, Environmental Specialist, at Steven.Varner@vdot.virginia.gov by September 4, 2018. Please reference "Tysons/Old Meadow Road Bicycle/Pedestrian Improvements" in the subject line. Since FABB’s founding, volunteers have been critical to our success and especially to our recent growth and expanded advocacy. This success has only increased our need for more volunteers to help make bicycling better in Fairfax County. Sadly, we occasionally have to turn down opportunities to help with outreach, leading social rides, working with allied non-profits, and representing bicyclists’ interests with government. Looking ahead to the fall and into early 2019, FABB has a diverse set of volunteer opportunities to offer that should appeal to a range of member interests and skills and, hopefully, to YOU. If not exactly right for you, then please share the following with friends who might be interested. 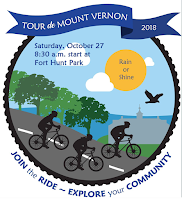 Tour de Mount Vernon. 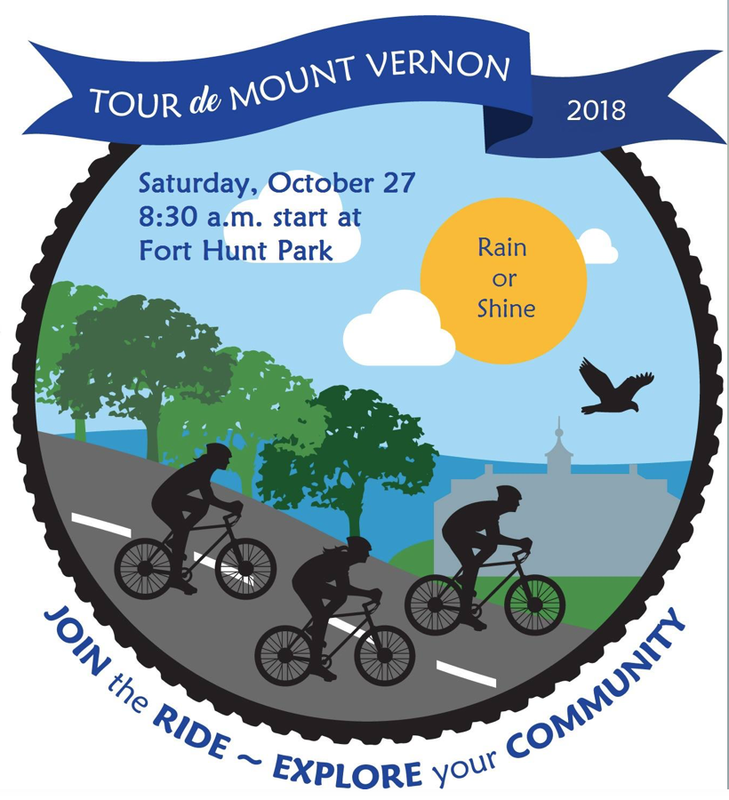 On Saturday, October 27, FABB will again co-host the Tour of the Mount Vernon. 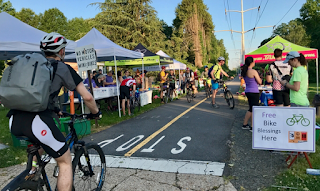 FABB is working with Supervisor Dan Storck, Fairfax County government offices, and local community and bicycle enthusiasts to build on last year's successful ride. We need volunteers for the day of event to register, distribute socks and t-shirts, and support the riders at pit stops along the route. Get Involved with TdMV Today. Social Rides. When not sponsoring its own social rides, FABB is regularly asked to lead rides for other organizations promoting bicycling. Social rides usually focus on education and encouragement, are at a slower easier pace, and take time to explore points of interests in our communities. These rides are a great way to make new friends and to get people involved in biking. Do you have any ideas for fun rides? FABB is happy to help you get started. Get Involved with Social Rides Today. Outreach. Are you a people person? Do you like engaging the public on issues you care about such as health, the environment, and bicycling? FABB could really use your help. 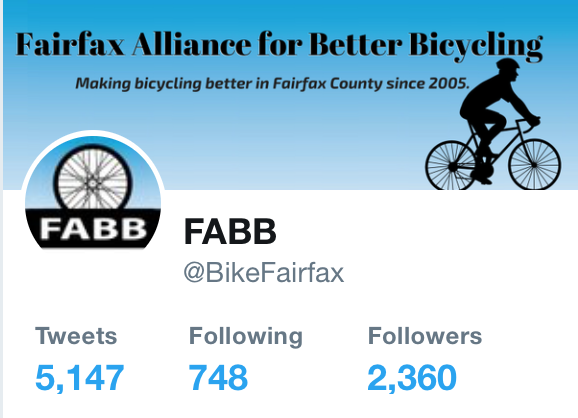 Throughout the year FABB has multiple opportunities to increase public awareness about bicycling in Fairfax County and build support for better bicycling opportunities. In addition to multiple Bike Month events in May, we attend Fairfax County’s Springfest, local health and wellness fairs, and other transportation-related events. Get Involved with Outreach Today. Advocacy. Have you been thinking about getting more involved in bicycle advocacy? FABB can help! We can provide you the basic training and help support your advocacy efforts. 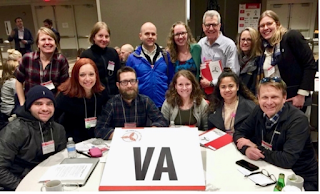 FABB also sends volunteers to attend major bicycle advocacy events where you can increase your skills and network with other bike advocates, all while also supporting FABB’s outreach to other organizations and government officials. National Bike Summit. FABB will be looking for volunteers to represent us at the National Bike Summit, which will be held in Washington, DC, from March 9-12. This is the biggest bike advocacy event of the year and includes workshops, group rides, and opportunities to meet with national legislators to advocate for better bicycle laws and infrastructure. Mid-Atlantic Greenways & Trails Summit. 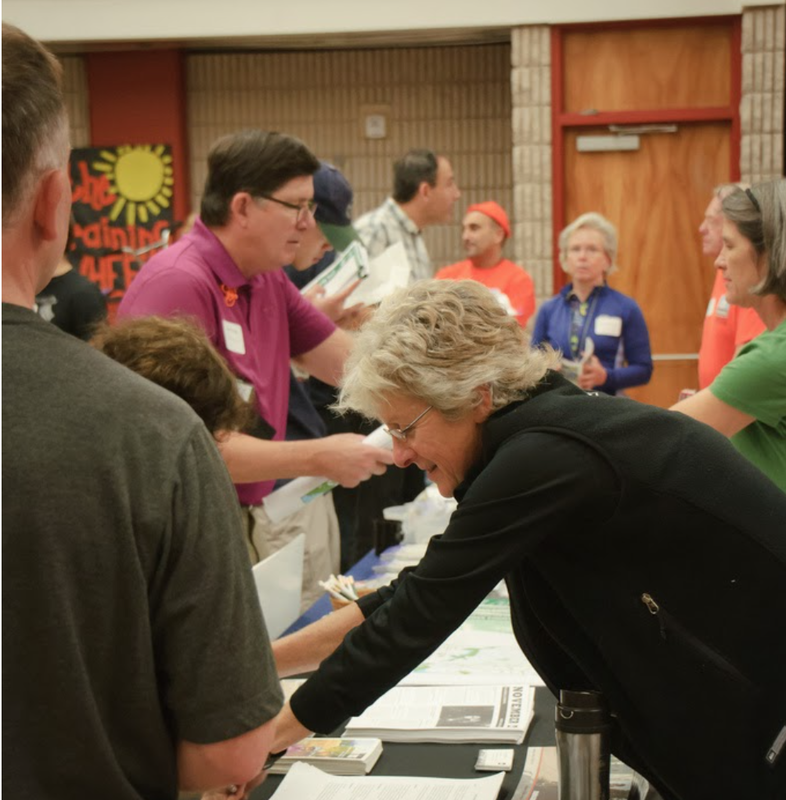 FABB, as part of its collaboration with the Capital Trails Coalition, is considering sending one or more volunteer representatives to the inaugural Mid-Atlantic Greenways & Trails Summit, hosted by East Coast Greenway Alliance. This summit, which will be in Philadelphia from April 4-6, 2019, will bring together active transportation advocates and leaders to help advance bicycling and walking innovations across the mid-Atlantic region. Get Involved With Advocacy Today. Communications. Do you love social media and have a desire to help spread a pro-bicycling message? FABB welcomes volunteers to help us in getting out the word on opportunities to make bicycling better in our region. Our Communications Coordinator can help match your interests and skills to our needs on social media, our website, and with local media outlets. Get Involved with Communications Today. FABB needs YOU! Even the smallest contribution of your time and efforts will go a long way toward helping us achieve our goal of making bicycling better in Fairfax County. Please help us keep up the momentum and volunteer by contacting FABB at info@fabb-bikes.org. Please volunteer now! It’s interesting, fun, and rewarding. We look forward to working with you. 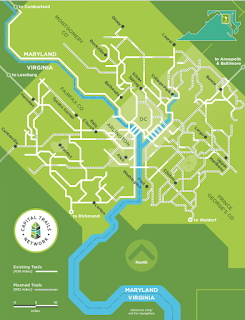 The Capital Trails Coalition is releasing a new map this week that conveys the overall concept of the Capital Trails Network while providing a stunning visual of what our region could look like when we prioritize trail development and connectivity. 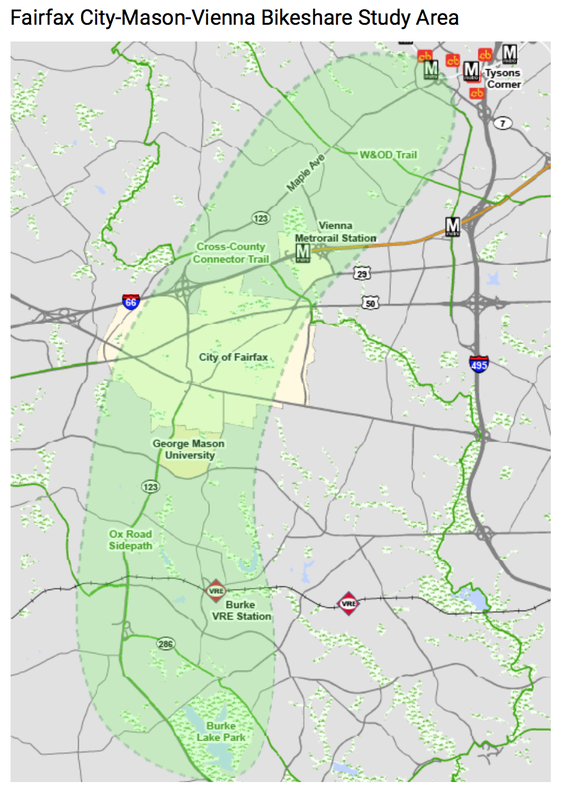 FABB is particularly excited to see so many planned trails and connections in and around Fairfax County. A connected regional trail network transforms public life in the region by providing healthy, low-stress options for accessible, safe transportation and recreation. 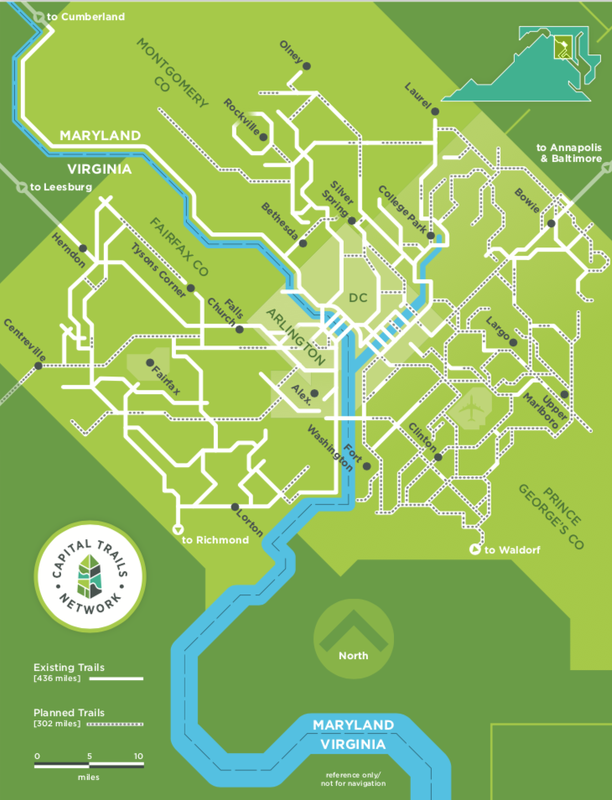 Many of the trails that will comprise the interconnected Capital Trails Network exist today, but hundreds of miles are needed before the network is complete. FABB is a proud member of the coalition and strongly supports the group’s effort to build a world-class trail network for our region. The collaboration among the coalition’s public and private organizations, agencies, business improvement districts, and citizen volunteers will bring this vision to life. If you would like to get involved in completing this vision, visit capitaltrailscoalition.org. You can also contact info@fabb-bikes.org to work as one of FABB’s representatives to the coalition. Around the clock construction on segments of Metrorail’s Orange, Blue, and Silver lines is set for August 11-26. During the next two weeks there will be limited capacity and almost certain crowding and delays on these lines. Metro leaders are encouraging commuters seek alternative means of transit. The good news is that FCDOT has prepared cue sheets and maps for commuters who want to use biking as an alternative. Find the information you need here. One significant advantage of traveling by bike is knowing how long it takes to get to your destination. It may take longer to ride than some other options but at least you can plan accordingly. Most Fairfax commuters travel long distances so it may not be feasible to complete your full commute by bike. However, bikes are a great way to connect non-Metro travel options. You could ride to the bus stop, put your bike on the rack on the front of the bus, then reverse the process at the other end of your bus ride. Here’s another opportunity for Fairfax County riders to make bicycling better. The City of Fairfax, George Mason University, the Town of Vienna, and Fairfax County are working together to evaluate bringing bikeshare to these communities. This feasibility study aims to understand how a bikeshare system would be used to travel throughout these communities as well as to connect to the metropolitan region. It also will identify what type of bikeshare system will be most successful and where shared bicycles and other bikeshare infrastructure should be located. 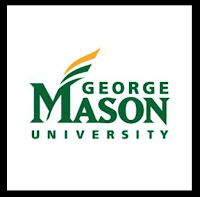 The bikeshare study is evaluating the area that extends from the W&OD trail in Vienna south through the City of Fairfax and into George Mason University. 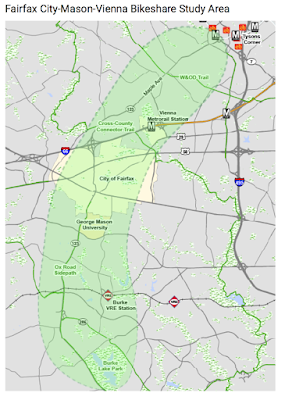 It includes the GMU-Fairfax campus south to the Burke VRE train station and nearby neighborhoods; the central corridor through the City of Fairfax including Old Town, Northfax, Fairfax Circle, and other commercial and residential centers along Chain Bridge Road and Old Lee Highway; neighborhoods around and including the Vienna/GMU-Fairfax Metrorail Station; and in Vienna, Maple Avenue, the W&OD trail, and surrounding neighborhoods. The study group wants your input! Study staff will be out in the community conducting "pop-up" events throughout the summer. Specific community meetings about bikeshare are being planned and will be announced soon. You also can provide input online by logging into cabistations.org to suggest locations where bikeshare stations or priority bikeshare parking areas should be located. There also is a brief survey you can take to express your interest in bikeshare and what kind of system you would like to see by answering a few short questions. 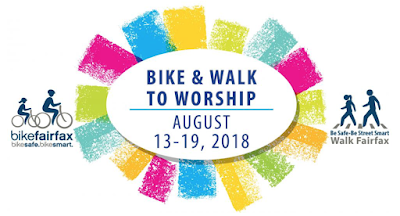 In another innovative approach to promoting biking and walking, Fairfax County Department of Transportation's Bicycle and Pedestrian team will be celebrating the county's first Bike and Walk to Worship Week from August 13th through 19th. Local congregations of all faiths are invited to host events (such as a "blessing of the bikes," prayer walks, or breakfasts) throughout the week. The FCDOT Bicycle and Pedestrian team will help by providing a toolkit document, branding for the event, and advice on bike routes and safety. FCDOT will even promote groups’ participation in Bike and Walk to Worship Week on social media. If you or someone you know might be interested in participating, you can get more information by emailing bikefairfax@fairfaxcounty.gov. FABB stands ready to assist with advice on planning rides. Contact us at info@fabb-bikes.org. Learn to Ride with FABB! 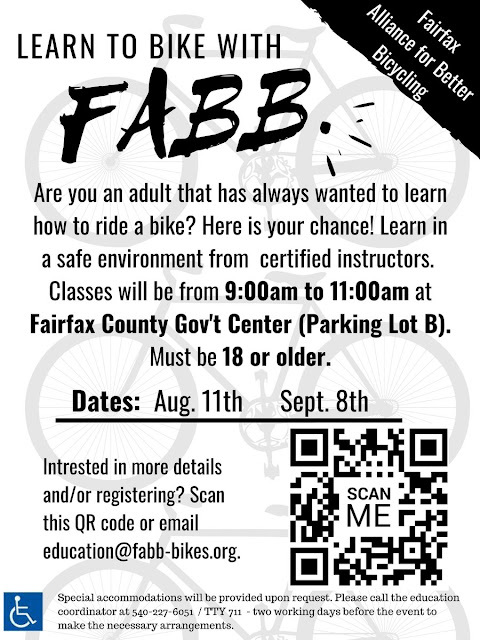 FABB is holding adult ( 18+) learn to ride classes on August 11th and September 8th at the Fairfax County Government Center. These two hour class will be taught by League of American Bicyclists-certified instructors, and are a great chance to learn to ride in a safe and secure environment. Participants will learn the basics of riding, including balance and how to control the bike with brakes. Don't miss out on this great opportunity! Help us spread the word by sharing this blog post with anyone you know that may be interested. If you have any questions contact education@fabb-bikes.org. Fairfax riders are still in fourth place in our category in the National Bike Challenge at the end of July. 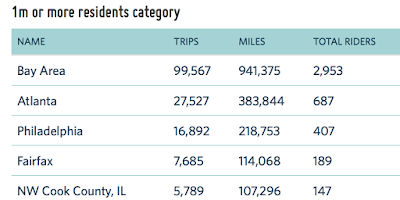 Chicago area cyclists, however, are closing the gap after apparently getting in some longer rides this past month. Still, Fairfax riders are doing well given all the severe weather over the past few weeks. 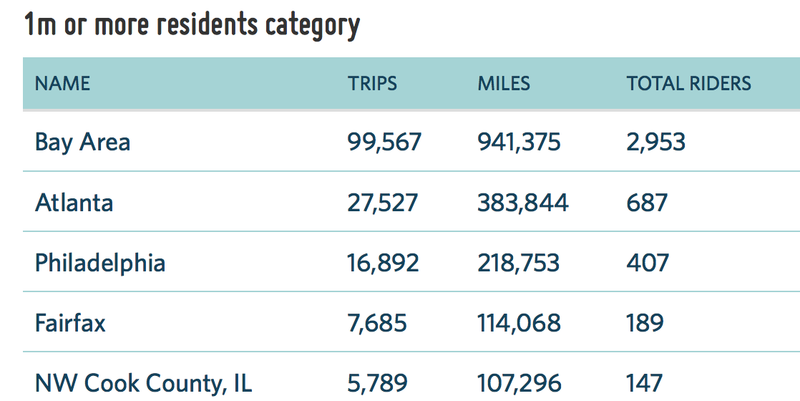 We have now logged nearly 7,700 trips and more than 114,000 miles. Friends and colleagues can still join up by registering at Love to Ride. 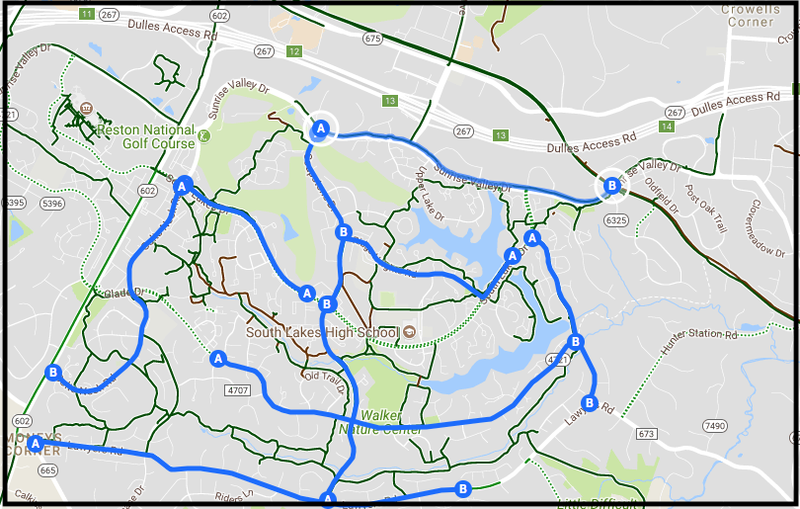 Adding more riders is the surest way to improve Fairfax County’s standing in the challenge, so please spread the word. In light of the busy summer schedules of FABB members, prospective guest speakers, and likely local attendees, the FABB Board has decided to postpone our monthly meeting for August. We will get back to the Mount Vernon and Lee Districts before too long. For now, however, enjoy the rest of your summer, keep biking, and we'll see you in September.